These mixes are great Christmas food gifts, teacher's gifts or anytime presents because the receiver can make them whenever the craving or time allows. 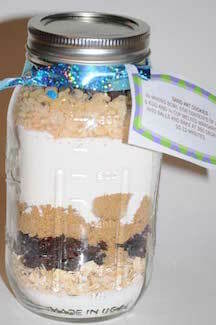 Mixes in a jar are also appealing to look at when all the different ingredients and colors are layered in the jar. 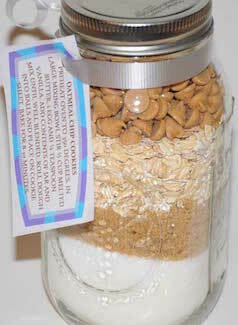 The key to making jar mixes is to layer the ingredients in order in a clean and dry quart jar. 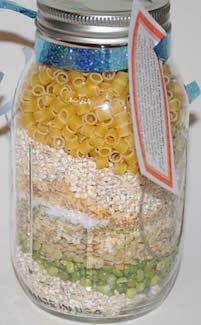 Make sure you pack down each ingredient or tap the end of the jar with your hand to pack ingredients in tight. Then screw on the lid and decorate with a piece of fabric. Attach the fabric with a rubber band and cover with a ribbon or piece of raffia. Include a tag with directions to make the recipe. 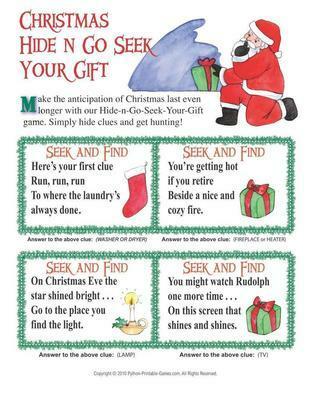 We've included gift tags with each mix below. 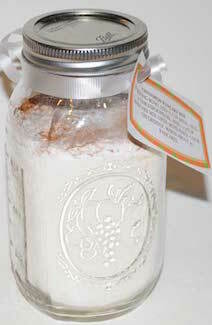 Attach a label for your Christmas food gift. Preheat oven to 350 degrees. In large mixing bowl stir ½ Cup melted butter, 1 egg and ¼ teaspoon vanilla. Add contents of jar and mix until well blended. Roll dough into balls and place on cookie sheet. Bake for 8-10 minutes. 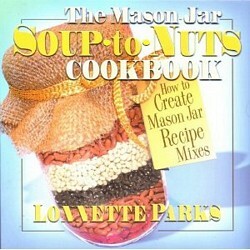 In mixing bowl add contents of jar with ½ Cup soft butter, ½ Cup creamy peanut butter, 1 egg and 1 teaspoon vanilla. Mix until well blended. Form into balls and place on cookie sheet. Bake at 350 degrees for 10-12 minutes. In mixing bowl stir contents of jar with 1 egg and ¼ Cup melted margarine. Form into balls and bake at 350 degrees for 10-12 minutes. 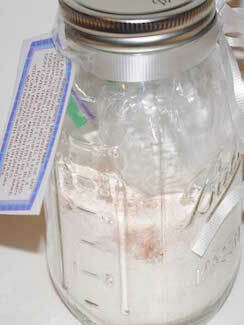 Layer in a quart jar and attach a label for your Christmas food gift. Add contents of jar to 3 quarts water, 2 stalks of celery, 2 sliced carrots, 1 cup shredded cabbage, optional, 1 lb. ground beef cooked and 2 Cups diced tomatoes. Cover and simmer for 45 minutes. Add in pasta and cook until vegetables are tender and pasta is done. 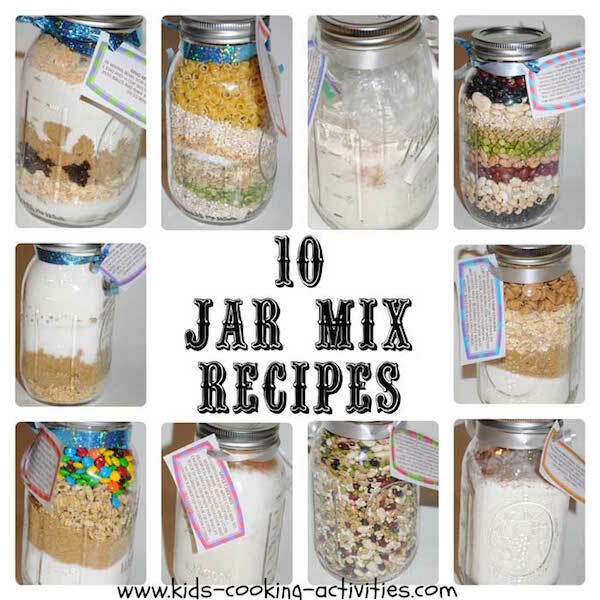 Need more Mixes in a Jar Recipes! 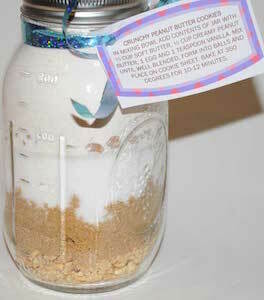 This recipe will make a large amount that you can create at least 10 Christmas food gifts with. For a smaller amount you can take away some bean varieties. 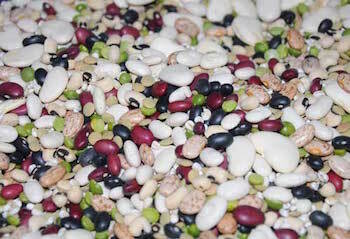 In large bowl stir beans together until well mixed. 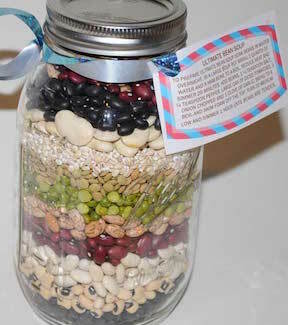 Fill quart jars and attach a label for your Christmas food gift. To prepare Ultimate Bean Soup soak beans in water overnight. In a large soup pot bring 2 quarts of water and a ham bone to a boil. Reduce heat and simmer 20 minutes. Add beans, 1 ¼ teaspoon salt, ¼ teaspoon pepper, large can of diced tomatoes, 1 onion chopped and 1 clove of garlic. Bring to a boil and skim foam off the top. Turn to medium-low and simmer 1 hour until beans are tender. Using a mixture of beans like the recipe above layer different bean varieties in 1/3 Cup measurements. Use the same label as the Ultimate Bean Soup recipe above. Add contents of apple cake mix to mixing bowl. Add 1 ½ Cup oil, 1 teaspoon vanilla, 3 eggs, and 3 cups chopped apples. Blend together and pour in tube or Bundt pan. Bake at 350 degrees for 1 hour or until toothpick inserted in center comes out clean. Add ingredients in order if there is room in the top add dried apples or other fruit to fill up to the top. In mixing bowl add ¾ Cup milk, 1 egg, 2 tablespoons oil, and 1 1/3 Cup pancake mix until moistened. Cook on griddle. Makes about 10 pancakes. 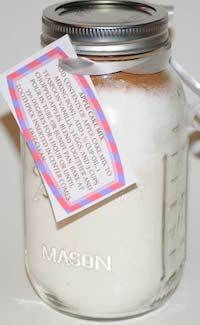 In a mixing bowl, add contents of jar with ¼ cup butter, melted, 1 egg, 1 teaspoon vanilla and 1 cup milk. Blend together. The batter will still be lumpy don't over mix. Fill muffin tins and bake for 15 minutes at 400 degrees. 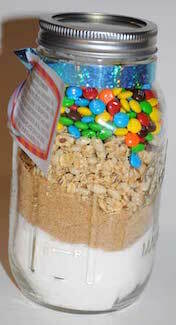 ***You can also add some fun holiday muffin cups with this jar mix. 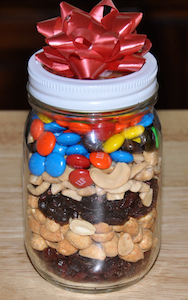 Try a snack treat jar for a decorative edible Christmas gift. 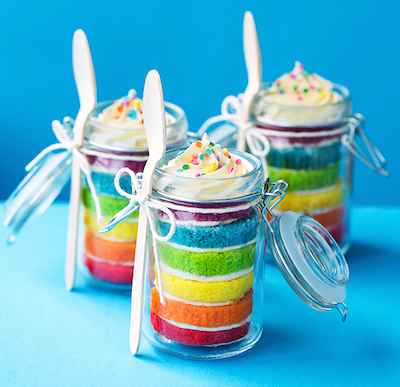 See our cake in a jar recipes. Do you have a Food Gift Recipe to Share?